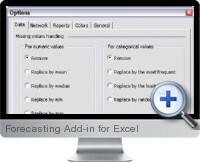 The Forecasting Add-in for Excel is based on neural networks. It is a powerful solution for Excel users who need a reliable and intuitive forecasting tool embedded into the familiar Excel interface. The Forecasting Add-in for Excel allows you to use neural networks to make forecasts and classifications directly inside your Excel worksheets. You can instantly apply capabilities of neural nets to Excel data, while still retaining all of Excel's data manipulation tools. The Forecasting Add-in for Excel allows reliable and easy forecasting and is designed especially for to save you time and money. It is reliable due to the latest advances of Artificial Intelligence integrated with proven neural network techniques. It is extremely easy to use for non-technical people. You need only to show your data and click one button to prepare a neural network tailored for your unique problem. This forecasting add-in has automatic neural net design and training. It is the only forecasting Excel add-in with automatic neural network architecture and parameters selection. It gives you access to breakthrough algorithms of automatic data pre-processing and neural network preparation inside Excel. With these algorithms you don't need to have prior experience in statistics and artificial intelligence to exploit the power of neural nets. These algorithms tailor your data to a neural network, select the most suitable architecture and prepare the network for solving your problem. Reliable forecasting with neural networks - High quality forecasting and classification due to employment of the latest achievements in artificial neural networks. The most reliable and constructive algorithm available today is implemented in this product. The algorithm was carefully adopted and tuned for real-world applications. Better algorithms mean better forecasting. Integration with Microsoft Excel - By providing embedded support for Microsoft Excel, Alyuda allows you to use neural networks for forecasting directly inside your Excel worksheets. You can instantly apply forecasting capabilities of neural networks to your Excel data, while still retaining all of Excel’s data manipulation and formatting tools. Together, the Forecasting add-in and Excel give you the best of both worlds. Exceptional ease of use - the Forecasting Add-in for Excel was designed specially to give maximum comfort to Excel users with exploiting neural networks for forecasting inside Excel. All features are easily accessed from additional menu items and use only standard Excel interface for data manipulation. Forecasting in several clicks - To get forecasting simply click 'Create Network' from the menu, select your input and target data and click 'Train' to let the Forecasting Add-in for Excel prepare the network for you. After this you need to just select or enter your new data and make one more click to get your forecasting ready. Furthermore, after the network is created you may save it and afterward you need only to load it, enter new data and get your forecasting within seconds. Hidden details of neural network theory - the Forecasting Add-in for Excel frees you from the need to learn details of neural network theory. It greatly simplifies the process of preparing a neural network needed for forecasting hiding from you any difficulty in neural network preparation and tuning. Automated network selection - the Forecasting Add-in for Excel automatically selects the most appropriate architecture for you forecasting problem. It runs a reliable constructive algorithm which finds the suitable network architecture automatically and saves you a lot of time. Detailed Reporting - For those who want to have a detailed report about the created neural network and its structure as well as to inspect network performance during forecasting and data pre-processing, the forecasting add-in delivers all needed information in separate Excel sheets. When creating a final report you may add training graph and error values of each iteration. The forecasting add-in is ideal for anyone who used to employ MS Excel for data analysis and begin using artificial intelligence for better forecasts.